The Office of Foreign Assets and Control (OFAC) included, for the first time, virtual currency addresses as part of the description of individuals in the SDN list. This is the first time any regulatory body has added specific virtual currency addresses to any sanctions list. This will represent a challenge to financial institutions, FinTECH, and every organization having to screen for OFAC lists, as a result of the inherent properties of virtual currencies and the broad reach of OFAC. 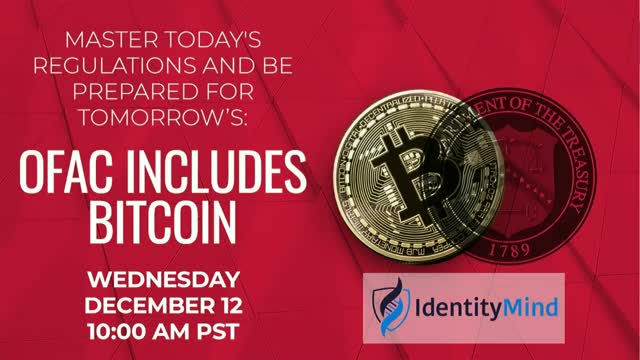 In this webinar, David Murray, VP of Products and Services at FIN, an expert in sanctions screening and virtual currencies, and IdentityMind’s product team leadership will discuss the background behind this decision, what it means for regulated institutions, what we can expect in the future, and more importantly how to ensure that your program is up to date for compliance. You know what you need to do to make your AML program a success. But, the gap between what you know you need and what you can deliver relegates those plans to the wish list. You’ve tried connecting different systems and data sources but find yourself stuck with a limited system that cannot keep up with what you need to be effective. The operational impact is significant and the fear of missing something important is always present. Modern technologies like IdentityMind can help you bridge the gap. We invite you to listen to Julie Conroy, Research Director at Aite Group and Jose Caldera, Chief Products and Marketing Officer at IdentityMind to discuss the current landscape of threats and compliance risk, how new technologies can address them, and a path for moving from legacy systems to the adoption of these new technologies. Transaction monitoring is required to meet AML and counter-terrorist financing (CTF) regulations. A good program can dynamically select the right sources of information to catch suspicious activity without bogging down compliance analysts with manual work. Many companies are still using dated or custom-built software which won’t pass muster with regulators, and make it harder to get that balance right. The best compliance programs take a risk-based approach, employing more stringent measures for higher-risk clients, while employing more lenient measures for trusted clients. With IdentityMind 2.0, we partnered with our clients to incorporate a highly accurate risk-based approach into our platform. IdentityMind 2.0 harnesses machine learning and time series anomaly detection to reduce false alerts, to increase automation, and to deliver a complete solution for your AML needs. Over $4 billion was raised through ICOs in 2017, attracting attention from entrepreneurs and regulators alike. How should a company raising funds through an ICO manage its anti-money laundering (AML) requirements without turning away customers, getting sued, or getting fined by various governments? Join us in this webinar as we take you through these features, and how they work together to result in an ICO you can confidently launch around the world. Spreadsheets are a popular tool for compliance officers in the financial industry. They're quick to set up and easily customizable. But as businesses grow and come under mounting regulatory oversight, tools like Excel rapidly fall behind in functionality, putting the business at risk of non-compliance the longer they're around. IdentityMind's AML solution processes transactions and monitors them against regulatory rules in real time. This automated solution is scalable, making it affordable for small and large companies alike. This presentation will provide review and analysis around risk, AML compliance and regulators in the Virtual Currency space around the world. Neal Reiter is responsible for leading IdentityMind’s Core Team in the Products group. Prior to IdentityMind, Neal led the San Francisco operations of Booz Allen Hamilton’s financial crimes team. While at Booz Allen, Neal supported global financial institutions and multinational corporations with regulatory compliance issues specifically related to AML. Neal is an expert in the virtual currency space, and has written many articles on the topic. Initial Coin Offerings (ICOs), Token Sales, Token Generating Events (TGE) are now all the rage. They are on the news, on your LinkedIn feed, on Twitter hashtags, and even on the Legislators' agendas… The US, Canada, and China are at the forefront of ICOs regulation, either defining them, supporting them, or banning them; and this is why it is important to understand the regulatory compliance implications these crowdfunding modalities carry, the legal framework that applies, and how to prepare - compliance wise - for a successful ICO. With this in mind we’ve put together this AML regulations primer, a webinar with the little details you need to know and understand before you start your journey into crypto-land and prepare for your upcoming ICO. - What kind of compliance do you need to do? It’s been a busy year in the Money Transfer industry, and even though some light has been shed over the regulatory landscape; banks and money service businesses are still facing challenges in terms of regulations, examiner’s expectations, compliance and risk management obligations, and bridging the gap between brick-and-mortar and the digital environment. But the board is set, so it’s time for action. With a setting such as this, we are looking to industry experts for guidance to navigate these unchartered waters, to understand how to go about some of these challenges, and to prepare our organizations to make the best of the opportunities that will arise from them. A tale as old as time: the want and need to move money, transfer it. And for the last 150 years that need has been met by the Money Transfer Industry. Today, this need is still as relevant as it was back then when the first money transfer took place, and so are the businesses providing that service. The Money Transfer Industry is, in fact, fundamental for the world economic activity. Much has happened since that first wire transfer: migration trends changes, de-risking, technology innovations, new business models, stricter regulations, higher regulators’ expectations, and the rise of FinTech; but the role of Money Transfer Organizations is just as important as ever; or maybe even more. With an outlook such as this, we are looking to industry experts for guidance to navigate these unknown waters. To understand the trends that will be defining the Industry in 2017, and how you can make sure your organization is ready the face the challenges, and make the best of the opportunities to come. - De-Risking: What’s in store for the year ahead? As human activity migrates online, challenges for authenticating physical identities arise, while businesses and consumers look around for guidance. Increasing demand for answers to the identity verification dilemma was just one of the contributing factors for the emancipation of the identity space as an industry of its own, vertical-agnostic. With such an outlook, it is important to understand what a Digital Identity is, and their current role in our society. Furthermore, how to leverage the identities to build better business models, deliver better products and services; and most importantly, how to take the leap and hop on the Identity Evolution train - after all, you don’t want to get left behind. We know implementing new technologies, and changing your current operations and processes can be a challenge. And even though the benefits far outweigh the costs, it always helps to have a guiding hand. Today, that guiding hand comes as a framework to understand how digital identities play a beneficial role in each industry and YOUR business, so you can start the journey from analog to digital identities within your organization. - Be able to differentiate physical from digital identities, and the attributes that shape them. - Appreciate the function digital identities play today, and their potential to help overcome present [and future] social and economic challenges. - Understand the role of Blockchain in the Digital Identity Ecosystem. - Recognize the business models that are placing identity at the center: Identity-as-a-Service, or Identity APIs - and how they can reshape the world as we know it. - Know WHY and HOW to make the leap over to digital identities within your business. For corporations and financial institutions RegTech is the vehicle to decrease compliance costs, control risks, and minimize the potential for regulatory actions and fines, while gaining operational efficiencies from the automation of manual processes. For regulators, it is the bridge between reactive supervision of financial activities and proactive and preventive real-time monitoring of all market participants. And this is only the beginning; the potential of RegTech is far greater than we can appreciate presently. With such an outlook, it is important we understand what RegTech is, and what its not. How to leverage RegTech solutions in order to reap the benefits of automated compliance, monitoring, and risk management; and most importantly how we can implement such solutions in our organizations. As with any piece of new technology, the process of discovering, researching, choosing and implementing a RegTech solution is no task for the faint hearted. And, even though we do know the benefits far outweigh the costs, it wouldn’t hurt to have a guiding hand; a roadmap for your first RegTech implementation, and how to achieve successful onboarding. Webcasts on all things Digital Identities, RegTech and Compliance. Our webcasts bring together experts to discuss how key issues in the RegTech and compliance fields affect key industries including Banking, MSBs, FinTech, Payment Service Providers, PayFacs, the Sharing Economy and more.